Attended by: Tower Hamlets Mayor John Biggs and Mayor of London Sadiq Khan. Slanting sculpture that is fixed above the ground that sits above a long horizontal concrete plinth that has one sharp alternation in direction before rising up to the aerial suspended sculpture. The vertical plinth has plaques embedded that list all of the victim's full names and ages. There are also individual plaques detailing what happened on that fateful night from various primary voices of members of the public who were there that fateful night. The top sculpture is made of sustainable teak, to represent the 19 steps on which those people died. The surnames of the victims are carved in large letters all around the sides and inside the 'roof' of the sculpture there are 173 angled cones that allow sunlight to shine through (designed with artistic interpretation to embody the lives lost). When looking up into the hollowed out void the teak interior is exactly the exactly the same dimension in which 300-400 people were trapped on the night of the disaster. the memorial is surrounded by paving stones that line up exactly with the steps leading into the station shelter where the deaths tragically occurred. There is a small uplight to replicate the 25 watt bulb that was the only source of light in the tube shelter entrance on the night of the disaster. Individual plaques with personal commemorations to the individuals who lost their lives during the stampede and panic. A routine maintenance regime has been sent to the local council so they, and the charity trustees can clean it regularly and keep an eye on the slot drains, garden area and the memorial itself. Comments: Estimated cost of £500,000 relates to design and construction. Details: London Borough of Tower Hamlets; London Underground, many corporate and personal donors. Organised by the Stairway to Heaven Memorial Trust. 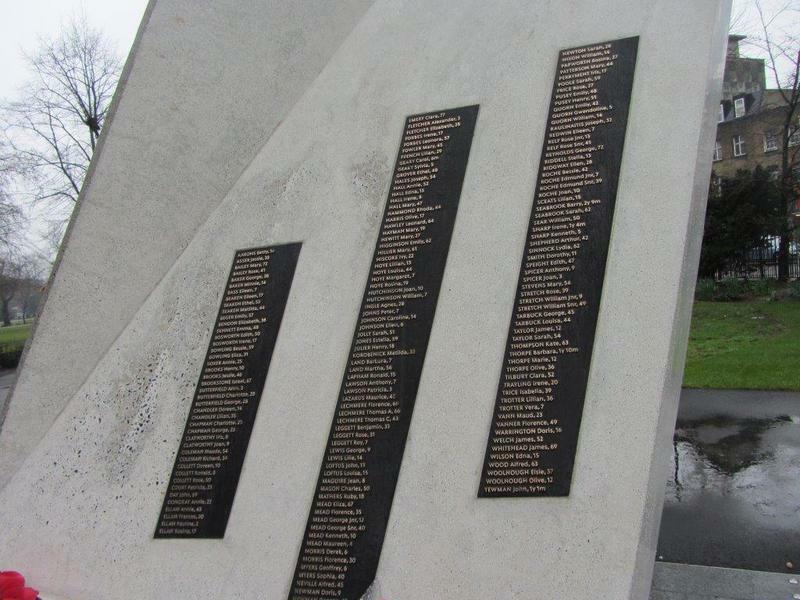 Additional comments from record donator S Scotting states: "It has taken almost 11 years to raise the funds needed to build this memorial and has now become a new landmark in this busy area of Bethnal Green/East London. It has allowed the survivors, rescuers, Emergency services personnel and the victims' relatives to obtain closure at last. The disaster was kept secret at the time and many of those involved were not allowed to talk about it and had no counseling to deal with the trauma that they experienced. All those involved are thrilled with the memorial. 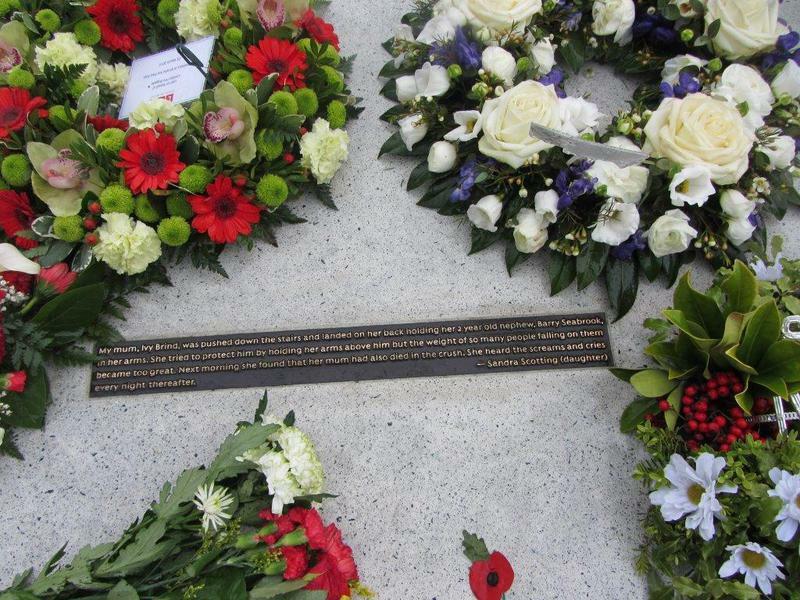 The architect's vision and hard work in helping to ensure the memorial was finished before the 75th anniversary of the disaster is to be commended, particularly as he has hardly been paid for all the time he has spent helping the charity to complete the project."